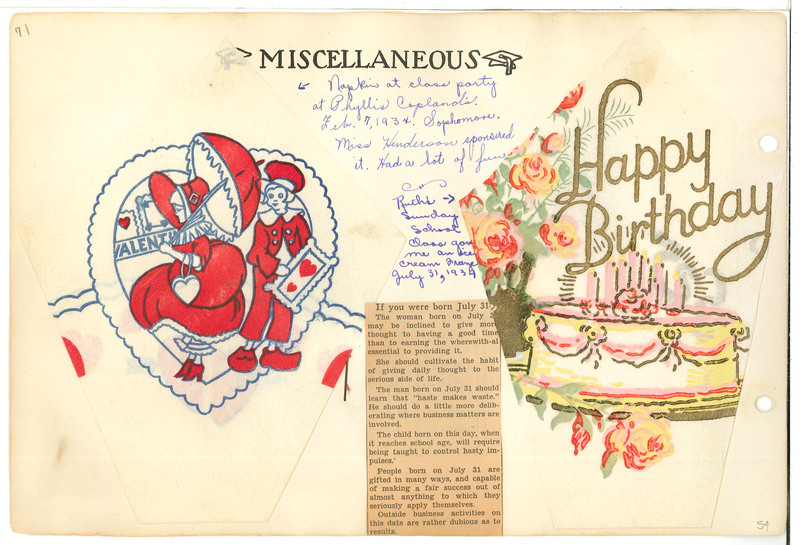 [printed headline:] MISCELLANEOUS [handwritten:] Napkin at class party at Phyllis Copland's. Feb. 7, 1934. Sophomore. Miss Henderson sponsored it. Had a lot of fun. Ruth's Sunday school class gave me an ice cream freeze July 31, 1934 [newspaper clipping:] If you were born July 31: The woman born on July 31 may be inclined to give more thought to having a good time than to earning the wherewith-al essential to providing it. She should cultivate the habit of giving daily thought to the serious side of life. The man born on July 31 should learn that "haste makes waste." He should do a little more deliberating where business matters are involved. The child born on this day, when it reaches school age, will require being taught to control hasty impulses. People born on July 31 are gifted in many ways, and capable of making a fair success out of almost anything to which they seriously apply themselves. Outside business activities on this date are rather dubious as to results.